I stood for nearly 25 minutes in the queue that snaked through the cavernous driveway of the Metro Toronto Convention Centre (MTCC) to reach the ticket counter of Fan Expo 2012 – one of North America’s biggest comics, anime, gaming, sci fi and horror expositions. There was a time when comic books were supposed to be for kids and teenagers or young adults, and there was that fringe that remained passionate about comics even after they were all grown up – like Sheldon Cooper and his geek friends in the Big Bang Theory. Obviously, that time was in a far-too-distant past. There were thousands of people, of all ages, in downtown Toronto all eagerly walking to the venue; some in costumes, some dressed as zombies, many in elaborate and detailed replicas of iconic characters from the perennial favourite – the Star Wars series, a few dressed as the baleful Bane from the Dark Knight Rises. Nearly two-decades-old, the three day expo attracts almost a hundred thousand people. That is as mainstream as it can get. It was my first visit to the expo, I had wanted to go to one of these shows (there are two in Toronto) since I heard of it soon after I came to Toronto. But for no particular reason, I couldn’t make it during these years. Finally, this year, I made myself do it, even though it was Sunday, and I had already agreed to attend the Writers’ Forum event on progressive Urdu writer Sajjad Zaheer (see post above). There were the big brands and studios occupying the biggest space. There were also comic book sellers, selling rare books, where the serious collectors thronged. What I found heartening was that the expo also had several artists selling their wares – sketches, drawings, handmade masks, other knick-knacks. There were many artists whose work I found interesting, and would’ve loved to spend some time chatting with them had it not been for such a rush. Among the more interesting tables was Kill Shakespeare. 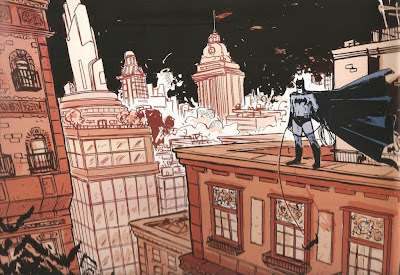 I also found Jason Copland’s drawings of Batman incredibly detailed (see accompanying visual). Copland is from Vancouver and was in Toronto only for the expo. I bought it for Che for his 15th birthday that’s coming up next month. Che’s not into reading comic books – he’s not into reading anything much. But if I had the variety of options he has today, perhaps even I would’ve preferred to play on my gaming console rather than read the frayed-at-the-edges comics. When I was his age, comics were the only thing I read. I’ve written earlier about my love comics. If you’re interested in reading about it, click here: Comics.